After seeing the excellent work by KroozA on his gargant chart, and Oddballz et al on the Battlewagon FAQ, I thought I'd contribute a little something too. 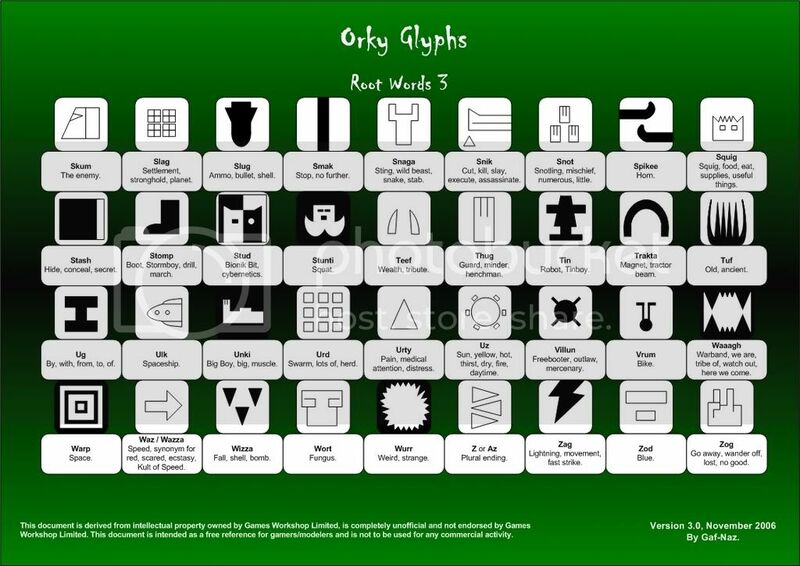 I've used the glyphs from "Waaargh the Orks", "Freebooterz", 1994's "Codex Orks" and the current Codex. Where different books have given different translations I've included them all. I don't have any of the GorkaMorka books, so would appreciate it if someone who does could check them for me and let me know if there's any glyphs in them that I've missed. 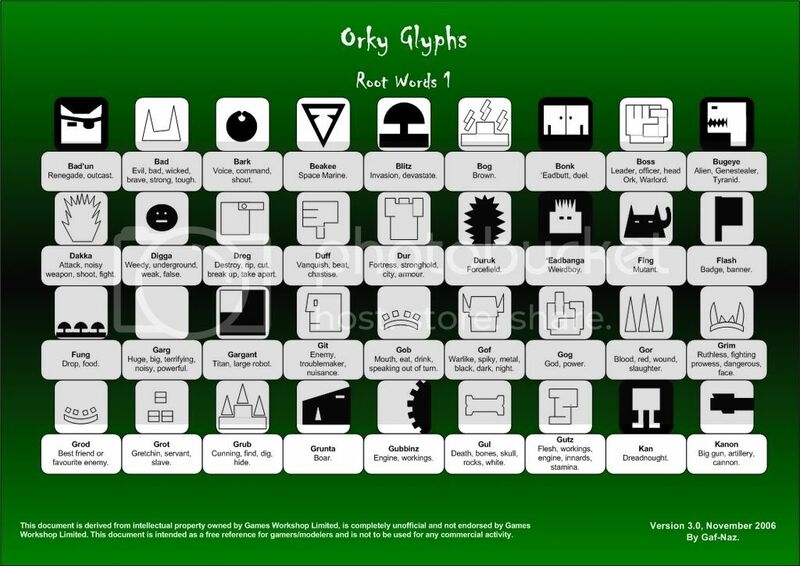 If anyone knows of any other glyphs then please let me know and I'll add them. Hope you all find this helpful when decking-out your vehicles with glyphs to insult your skumgrods. --"Orkses is never beaten in battle. If we win we win, if we die we die so we don't count as beat. If we runs we dont count as beat neither, so we can come back and 'ave anuvver go, see"
Da JakLs : "yella' an reds our kula see, coz gork and mork won't let uz be"
Thanks for the comments ladz. 4ton - thanks for looking those up. I'll add them in the week sometime and you can let me know how close I get. Gotta get the GorkaMorka books for my library some day. GS - glad to have inspired you and looking forward to see a glyphtastic wagon. Thanks for the comments ladz. 4ton - thanks for looking those up. I'll add them in the week sometime and you can let me know how close I get. Gotta get the GorkaMorka books for my library some day. GS - glad to have inspired you and looking forward to see a glyphtastic wagon. Aww I dunno, maybe there's something missing, say a red star or something... 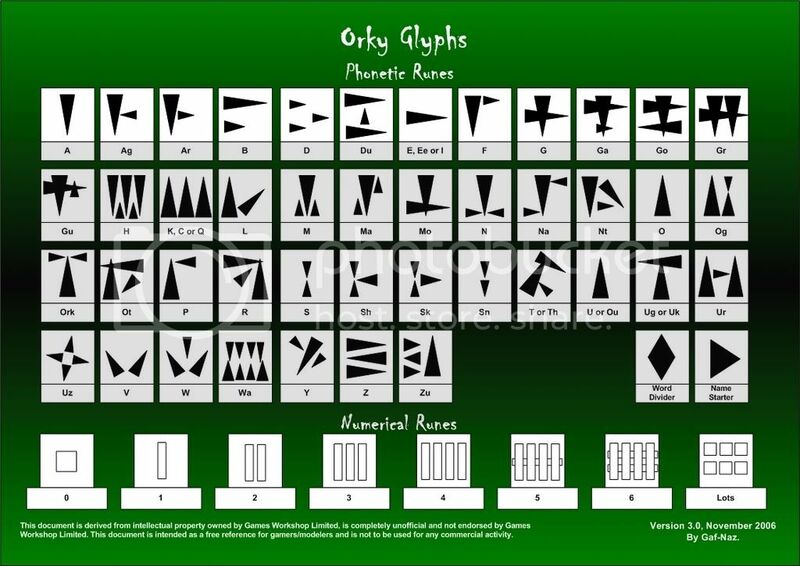 I like, very kool Naz - it's kinda annoying because there's glyphs there that are so cool I want to start certain ork armies ta use em... Good work, nicely presented. Good call on the red star Dim. I'll add it under Klan Glyphs as "Grot Rebels". Keep the suggestions coming. I'd forgotten about Grot Rebels - they must have appeared when I was out of 40K for a few years. And the red star seems to be their official symbol, so in it goes. I remember the day when any grot with visions of rebellion got 'volunteered' for Shokk Attak Gun testing. My hat's off to you! It looks like I've been outdone. Maybe we can get these put on the main website gallery, as a resource to all orks. 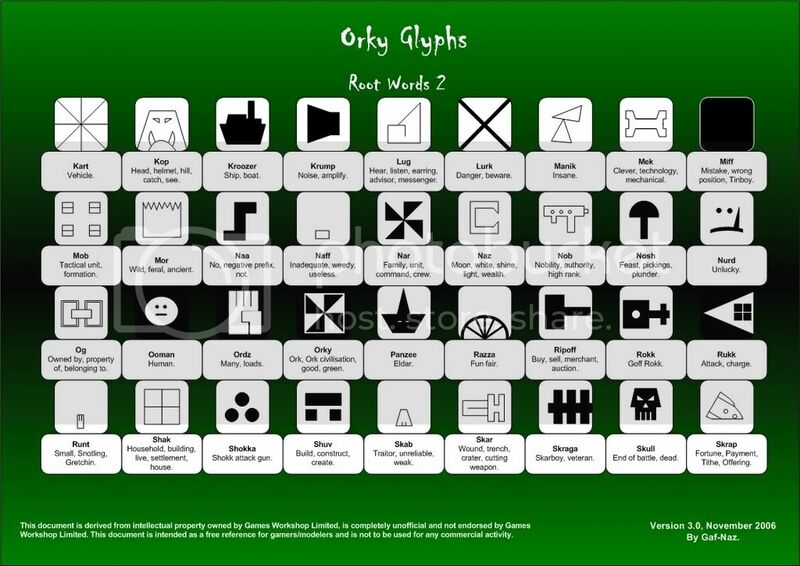 Maybe we can get these put on the main website gallery, as a resource to all orks. A tad questionable, actually, it could be perceived as IP infringement.... even having it here. Not that I don't appreciate all the work that's gone into this, and it's nice for members without all the books to have the resource. True, although it seems a little backwards to me that GW would hoard IP rights over a book that it doesn't even publish anymore. Still, maybe some credits to GW are necessary. Do you really think this could be considered IP infringement? If you want me to remove it then please let me know as I wouldn't want to cause any trouble for da Waaagh. I think I'll email GW legal and see what they say. I love it how the sign for "bioniks" ("Stud") is an Orky version of the Adeptus Mechinicus symbol. I've updated the charts - see the first post. I've studied GW's IP policy, and spoken to a couple of legal people I know, and added a disclaimer which I feel addresses the IP rights issue. However, I've also emailed GW's legal department and asked for their opinion/suggestions and will bide by their decision - though I withold the right to appeal! Again, if any of the Nobs ask me to remove the charts, I will do. I've also added the glyphs for Digga and Skrap - thanks 4ton. And the Rebel Grot star - thanks Dim. Does Skrap look OK? Wasn't sure if there was a line under the crashed hulk or not. All C&C and glyphs I've missed welcome.